The standard treatments for cancer can be harsh on your body. Doctors often treat blood cancer such as leukemia with chemotherapy, radiation and blood transfusions. As you may know already, chemotherapy comes with a long list of side effects, some of which are long-term. Chemo, along with other blood cancer treatments, can wreak havoc on your body. It’s no wonder so many cancer patients are turning to medical marijuana for blood cancer to alleviate their cancer and treatment-related symptoms. Doctors use the term “blood cancer” to describe certain malignancies of the blood, lymph nodes or bone marrow affecting the function or production of healthy blood cells. As these cancerous blood cells reproduce and multiply, they cause your circulatory and immune systems life-threatening damage. In the United States alone, a person dies from a type of blood cancer every nine minutes or so, reports the Leukemia & Lymphoma society. This statistic represents nearly 160 individuals a day or more than six individuals an hour. Each component comes from stem cells originally, which could turn into any blood cell type as they mature and divide. When issues arise during this process, blood cancers can occur. How these issues happen determines the type of blood cancer. These problems typically result in our body producing many immature blood cells not able to do their job correctly. They may also keep other blood cell types from doing their jobs correctly too since they can also clog your bone marrow. Leukemia: Leukemia is cancer located in your bone marrow and blood. Rapid abnormal white blood cell production causes it. A vast amount of these abnormal white blood cells can’t fight infection, and they impair your bone marrow’s ability to produce platelets and red blood cells. Lymphoma: Lymphoma is a blood cancer affecting your lymphatic system, which is responsible for removing any excess fluid from your body and producing immune cells. Your white blood cells (lymphocytes) fight infection. When they become abnormal, they turn into lymphoma cells, multiply and gather up in your tissues and lymph nodes. They eventually impair your immune system. Myeloma: Myeloma is cancer of your plasma cells, which are white blood cells responsible for generating antibodies in your body to fight infection and disease. Myeloma cells prevent these antibodies from being produced and leave your immune system weak and susceptible to infection. Myeloproliferative neoplasms (MPNs):MPNs are a type of blood cancer beginning with a change (abnormal mutation) in your bone marrow stem cells. This unusual mutation leads to too much production of any combination of red cells, white cells and platelets. Myelodysplastic syndromes (MDS):MDS is a group of bone marrow and blood diseases with various levels of severity, life expectancy and treatment options. It can be treatment-related or primary (de novo). The history of blood cancer dates back thousands of years, reports the biotechnology corporation Genentech. Records of fossils show evidence of blood cancer effects and that the ancient Greeks observed a condition such as leukemia. But, it was Thomas Hodgkin, a British doctor, who published lymphoma’s first description in 1832, leading to clinical diagnoses. They also identified other subtle classifications as well that have led to over 100 subtypes. But as physicians’ knowledge and understanding continued to advance, their ability to treat patients with these diseases was still decades behind. In the earlier 20th century, scientists made discoveries of lymphoma treatments such as radioactive elements and x-rays. There have been many breakthroughs since then. Chemotherapy, radiation and bone marrow transplants opened up new doors for blood cancer treatment. Physicians were finally able to fight these cancers after many centuries of helplessness. Blood cancers may produce various symptoms. Some signs are the same with all blood cancers, while other symptoms are more characteristic of certain types. For instance, swollen lymph nodes often occur with lymphomas and bone pain with myeloma. 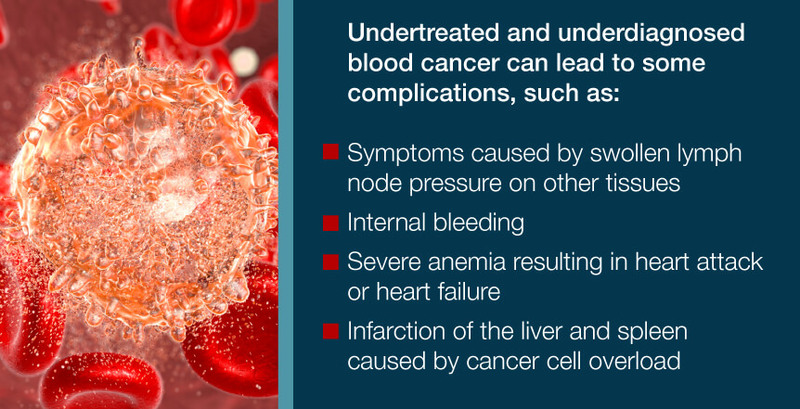 If you’re experiencing any of these symptoms, you should visit your doctor, who will give you a referral to a specialist for further testing if they think it could be a blood cancer. Anxiety and depression are typical responses to receiving a cancer diagnosis and undergoing treatment. You might feel the treatment is taking over your life. It can overwhelm you. Having to decide on treatment, along with worries about money for medical care, finding time and communicating with friends and family can all add stress too. Additionally, certain anticancer medicines can contribute to symptoms of depression and feelings of anxiety. Along with feeling anxious or depressed, you might also feel guilty for feeling the way you do. Some individuals who are receiving treatment may not feel as good as they hoped to while undergoing treatment or after. And although they try to, they may be unable to experience happiness or gratefulness for their progress. These types of feelings can lead to guilt. If you experience these emotions, don’t ignore them. Depression treatment can be beneficial when you’re living with cancer. If your mood or symptoms don’t improve with time, seek medical advice. If you feel sad, depressed or anxious every day for a couple of weeks, ask your physician for guidance and help. Once your doctor considers the above factors, they’ll suggest one or more of the treatments below. Your doctor may observe your condition carefully before giving you any treatment until symptoms show up or change. They may use lab tests and regular physical exams for monitoring the progression of your disease. During this time, you won’t undergo any types of treatment or take any drugs. Radiation therapy damages the cells’ genetic material (DNA), preventing them from reproducing and growing. While the doctor directs the radiation at cancer cells, it unfortunately also damages the healthy cells nearby. However, current radiotherapy methods are improving and reducing “scatter” to neighboring tissues, meaning that the benefit of radiation therapy often outweighs its risk. Palliative care is a particular type of medical care focusing on offering you symptom and stress relief from your illness. The objective is to improve both your quality of life and that of your caregivers or family. With palliative care, a team of specialists works to provide you care, including palliative-care nurses, doctors and social workers. This strategy provides you with an extra layer of support at any stage of your disease. Palliative care can be applied along with curative treatment or by itself. A May 2017 study found that CBD and THC cannabis compounds kill leukemia cells successfully by themselves. But, according to the study, the cannabinoids work most efficiently if used after chemotherapy — not before. The study was involved with a rapidly growing body of lab evidence suggesting marijuana kills cancer effectively. For about 20 years, researchers have studied cannabis’s cancer-fighting properties in the laboratory. Researchers have conducted hundreds of scientific studies over the last few decades proving cannabis kills cancer cells. Cancers of the blood like leukemia and lymphoma are the subject of several cannabis-based research studies. These cancers can wreak havoc on the immune system, leaving patients defenseless against illness or disease. Two studies explore how marijuana could be used to eradicate cancerous cells in the blood. Led to an increase in cancer cell death. Blood Cancer Study #2: Wentao Jia et al. Another 2006 study entitled “Delta9-tetrahydrocannabinol-induced apoptosis in Jurkat leukemia T cells is regulated by translocation of Bad to mitochondria” confirmed THC causes death to cancer cells found in leukemia patients. It explored the pathways cannabinoids use on a cellular level to bring about these results. What Side Effects/Symptoms of Blood Cancer Can Medical Marijuana Treat? Oral medical weed offers anti-cancer effects and causes a reduction in leukemic blast cell count. As the medical cannabis industry continues to grow, cultivators are growing strains that target specific symptoms. As cannabis eases your symptoms, you can live a healthier and happier life. The most common use for medical pot treatment is as an analgesic (pain reliever), as cancer patients often deal with debilitating pain. When dealing with cancer, many patients also struggle with severe mood changes and depression. Patients with cancer need to feel revitalized and well-rested to battle their symptoms and the disease. Nausea or vomiting can keep you from living your life to the fullest. If your cancer isn’t treated, it can lead to wasting illness or cachexia. Those undergoing cancer treatments often find it difficult to eat. Of course, you’ll want to sit down with a qualified marijuana doctor and discuss which method of cannabis delivery for blood cancer is best for your situation. However, there’s no harm in experimenting yourself with the doctor’s approval. If you are struggling with blood cancer and considering marijuana as blood cancer treatment, you may qualify in your state for a medical marijuana card. It just takes a quick appointment with a doctor who can give you your recommendation. Once you receive your card, you can shop around for your perfect cannabis and blood cancer products to find relief from your debilitating symptoms. You can search for a medical marijuana dispensary or find a cannabis doctor at Marijuana Doctors. And with a plethora of resources and qualified specialists to answer your questions, you’ll be able to enjoy the ease of everything you need all in one spot.